This weekend is our time to deal with the dozens of dahlia tubers that are waiting in the garage. My husband dug them over the past two weeks, and they need to be wrapped for winter storage. We’ll cover each bunch with several layers of newspaper, and stick the bundles into cardboard boxes. Next spring they’ll be removed from these enclosures, the tubers will be separated, and they’ll once again be planted in our gardens. It’s worth taking the time to put these into storage, I think, even though we’ll order a few new varieties from Corralitos Gardens next spring. Putting some plants into winter storage is almost as satisfying as stocking the root cellar and freezer with food from the vegetable garden: small bits of the summer bounty wait for us. Sometimes a small investment in time, thought or effort will result in great pleasure and beautiful harvests in the future. Where else in our lives do we have opportunities to be “saving summer”? 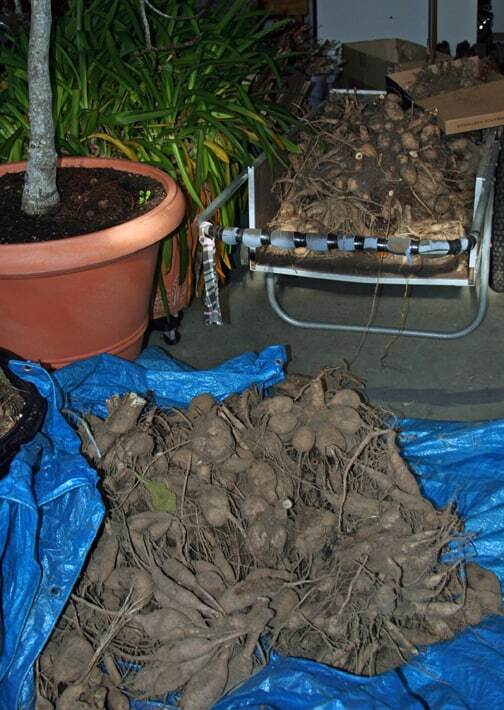 As usual, there are far more tubers than we'll need next year. We'll separate one or two from each clump and give the rest away.